Georgia defenders were still shuffling on and off the field when Joe Burrow took the snap from Lloyd Cushenberry and lunged forward. The quarterback got stood up and driven backward, but not before picking up the precious inches that made the difference between keeping the drive alive and turning it over on his own side of the field. That aggressiveness — and the tempo at which LSU executed it — made the difference as LSU put a rather thorough 36-16 beating on the No. 2 team in the country at Tiger Stadium on Saturday. All week, whether it be at a press conference on Monday or his call-in radio show on Wednesday, Orgeron fielded questions about a conservative fourth-down decision that contributed to LSU’s 27-19 loss at Florida the Saturday before. Did you think about going for it? Why not ask for a review of the spot? Orgeron explained that the replay didn’t come in to the coaches up in the booth in time to decide on a challenge. He added that he didn’t feel like LSU had a play for the forth-and-short, so he instead sent out Cole Tracy to kick a field goal. Given time to reflect on the sequence of events, Orgeron admitted that he’d have gone for it if he could do it all over again. Perhaps the game would have ended differently if he had. That much is impossible to tell, but every time a similar situation cropped up against Georgia, Orgeron rolled the dice with his offense. And once his Tigers got ahead of Georgia, he never once thought about letting them let up. In fact, he promised his team as much. Most coaches tend to get conservative and play too tight in a big games like this one, but Orgeron played it the opposite way entirely. LSU went for and converted three different fourth downs in the first half alone against Georgia to build a 16-0 lead going into the intermission. Orgeron wanted to be aggressive with most of a sellout crowd of 102,000-plus people behind him. All the coach needed was a bit of momentum at his back to push down on the gas pedal. The undefeated Bulldogs provided such an opening in the first quarter. Trailing 3-0, Georgia coach Kirby Smart tried a gamble of his own in the form of a fake field goal on fourth-and-nine. LSU was having none of it and stripped Bulldog kicker Rodrigo Blankenship well short of the line to gain. LSU promptly cashed in on the trick play gone array. A 47-yard scamper from Clyde Edwards-Helaire set up first-and-goal. Nick Brossette was ruled just short on a third-down carry, and after a video review, LSU rushed back to the line and Burrow scored on the first of many quarterback sneaks. LSU led 13-0 late in the second quarter when the defense got the ball back with yet another three-and-out. Smelling blood in the water, Orgeron went for two difference fourth-and-short scenarios, including the sneak called from his own 38-yard line. Burrow converted that one. 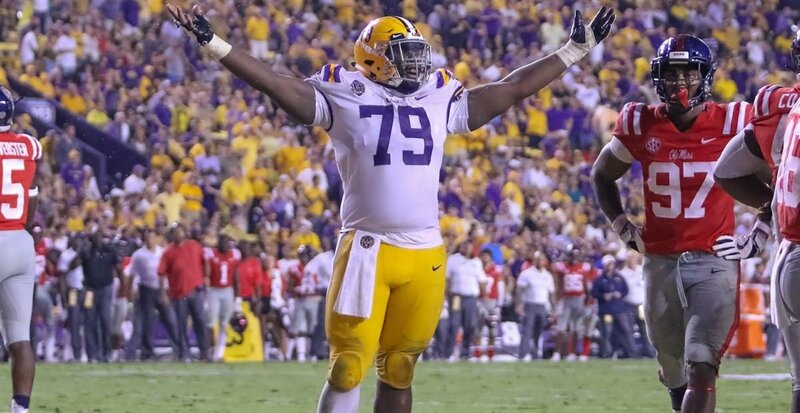 Later on in the drive, LSU hustled to the line after failing to convert third down and Edwards-Helaire made a man miss in the hole to convert. LSU eventually had to settle for one of five Cole Tracy field goals on that drive, but they’d sufficiently demoralized the opposition with the grind of a 15-play, 50-yard drive. Those runs — and the quarterback sneaks in particular — were a clear message that LSU was going to be the aggressor. Orgeron sensed he had an angry team coming off their first loss, and they fed on that from practice on Monday through the moment the fans started rushing onto the field at Tiger Stadium. LSU never let up in the second half. Even when Orgeron elected to punt on fourth-and-3, Josh Growden pinned Georgia back inside its own 5-yard line. Kristian Fulton intercepted Jake Fromm on the ensuing drive, and another fourth-down conversion via Burrow sneak set up a field goal to extend the lead. Georgia pulled within 10 points on a thunderous touchdown run from Elijah Holyfield late in the third quarter. The momentum seemed to be shifting away from LSU, but after the two sides traded punts, LSU went up top to seal the victory. With the ball around midfield, Burrow hit Justin Jefferson deep for a 36-yard gain. Two plays later, Burrow burrowed into the end zone for his second touchdown of the afternoon on another well-executed sneak. LSU made enough statement plays to earn one hell of a statement win, and with Mississippi State and Alabama coming to Tiger Stadium in the weeks ahead, everything is right there in front of them.